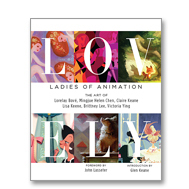 The beautiful minds of six extremely successful women artists in the entertainment industry present LOVELY: LADIES OF ANIMATION. The history of art in animation has had many female heroes, this elite group is continuing the tradition and building upon it. Featuring the first published personal works by Lorelay Bove, Lisa Keene and Claire Keane, this title is an indispensable addition to the library of those interested in animation. With a variety of styles from graphic works to realistic portraits, these images will inspire and delight the viewer with each turn of the page. Categories: artist series, Books. Tags: Brittney Lee, Claire Keane, Lisa Keene, Lorelay Bove, Mingjue Chen, victoria ying.